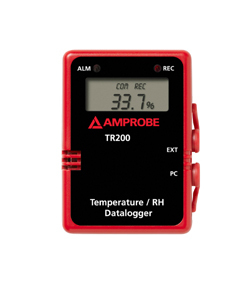 Amprobe’s Model TR200-A takes both temperature and relative humidity readings in one compact size unit. Use the included Amprobe software for recording measurements to your personal computer. Set up these parameters for recording: sample interval timing, start/stop, date and time, hi/lo alarm threshold, unit selection, and number of memory points. 109 TruReward$ points will be placed in your account when you buy this item.